Castiglioncello: a travel guide to the village of Castiglioncello, hotels, campsites, farm holidays, real estate, rent a car, beaches, sightseeing, photo gallery, top things to see. Castigliocello, with its little bays, pinewoods and sea cliffs, is a seaside town in Tuscany which combines culture and relaxation at its best. XIX century, the so-called “Macchiaioli” painters used to meet up at the patron of the arts Diego Marcelli’s Country House and set up the School of Castiglioncello: there are plenty paintings dating back to that period in which you can admire the landscapes of Castiglioncello and its surroundings. Later on in the 60s, Castiglioncello earned a world popularity thanks to the Dino Risi's movie “Il Sorpasso”, with Vittorio Gassman and J. L. Trintignant, which was set just in Castigliocello. 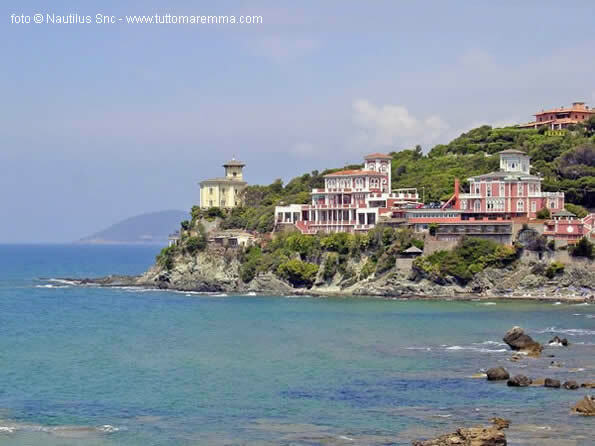 It was the period during which movie stars such as Gassman, Alberto Sordi, Marcello Mastroianni, to name just a few, spent their Summer holidays on this coast. Castiglionecello is still today the favourite Summer resort of a number of world famous personalities belonging to the world of arts and culture, who choose Castiglioncello as a best place for their holidays, a place home to many cultural events and festivals such as one of the most prestigious Italian literary award organized yearly in September.